Quite a coup for the California. 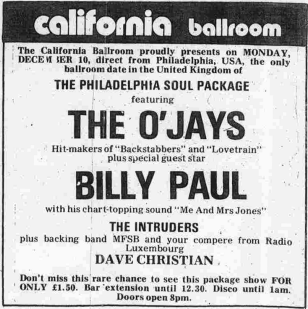 Not only did they get one of the hottest packages around, with The O'Jays, Billy Paul and the Intruders but they managed to pick up MFSB as well. MFSB didn't appear at most of the revue dates including the Hammersmith Odeon. Not sure why this is but it could be that they took up so much space!